Hey, it’s officially summer! I know, I know, it’s not really OFFICIALLY summer until you have tomatoes coming out of your ears, but this year it’s all stone fruit all the time, so I’m declaring it to be officially summer. Two weeks ago, we were gifted ten pounds of overripe apricots, so of course I immediately got out the canning stuff. Usually my apricot jam sets like the sun on the British empire, which is to say IT DOESN’T, but this time I pulled up a barstool by the stove and stirred with one hand and played SimCity Buildit with the other (there may have been a gin and tonic, too,) and lo, I eventually had a batch of apricot jam that had actually set. I mean, you can SPREAD it. And it tastes amazing. Just fruit, sugar, lemon juice and the precious precious cyanidey nugget of noyaux. And some damned patience for once. Obviously that batch is getting used for toast, but that still left me with a bunch of last year’s annoyingly runny batch. There’s also way too much of the carrot-habanero hot sauce/chemical weapon I made last month, so I decided to throw them together and see what came of it. It was nothing short of miraculous. I sauteed half an onion in some olive oil, then dumped two jars of the runny apricot deliciousness in, added a couple of tablespoons of the incendiary hot sauce, then tinkered around with salt, dry mustard, vinegar and Worcestershire sauce until I had a sweet, savory, tangy masterpiece, if I do say so myself. I seasoned a rack of spare ribs with salt and pepper, Nathan fired up the Weber grill for the first time in a shamefully long while, then those ribs eventually got slathered with the sauce. It was heaven. It was summer. The sauce really was just made up on the spot, so I can’t produce a recipe. I’m going to pay attention next time, because it turned out so well that we’re going to try to reproduce it and actually can some. However, here is the recipe I used for the carrot-habanero sauce. Be careful not to take any deep breaths once you’ve added the vinegar. It was painful and I had to leave the kitchen for a minute. I swiped the recipe from the lovely people at happyyolks.com, who take better photographs than I could ever hope to do. Roast the garlic in a skillet over medium heat, turning regularly until soft and blackened in spots, 10 to 15 minutes. 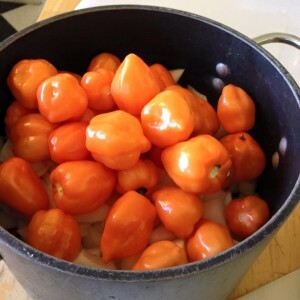 In the same pot, combine the carrot, onion and habanero chiles with the vinegar, 3 cups water, salt and sugar. Partially cover and simmer over medium-low heat until the carrots are thoroughly tender, about 20 minutes. Blend until smooth. [Drunkard Comment: I used an immersion blender (aka “rhnn thingy”) to do the blending. It was very successful, but I had to cover my mouth so I didn’t breathe in the chemical weaponry.] Thin with a lime juice and more water if the sauce seems too thick. Taste and add salt as preferred. Store in glass jars in the fridge.